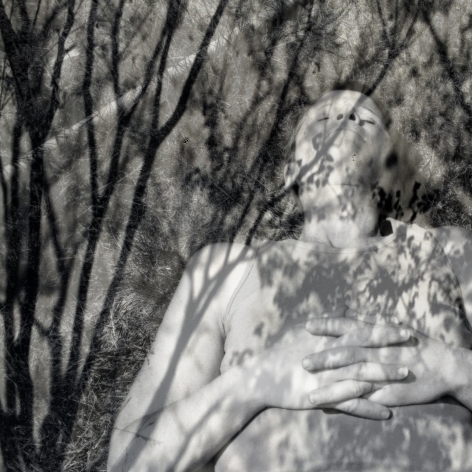 (Los Angeles, CA) - DENK gallery is pleased to announce Parting and Returning, a solo exhibition of new photographic works by Los Angeles-based artist, Augusta Wood. Wood's evocative images invoke a feeling of spatial and temporal simultaneity. Using photography as a fluid and flexible medium rather than an empirically finite one, Wood combines photographs she's taken at different moments in time, some weeks apart and others years, to synthesize new convergences of history, time and place. A project at times exploratory and tangential, and at others poignantly revisionist, Wood investigates the overlap and continuity of perceived time. Wood's work in the past has explored themes like the recall of lost domestic spaces from her childhood, looking to the subjective nature of imagistic memory and the personal act of remembering "home." Though she continues to investigate the perceptual dimensions of "seeing," and the personally loaded conversion of sight to memory, Wood's new body of work refocuses on the conscious experience and immediacy of the present as an active constellation of multiple times and tenses rather than a singular moment exempt from past and future. Working through a collage-like process, Wood constructs images through an overlay of separate and distinct photographic captures. 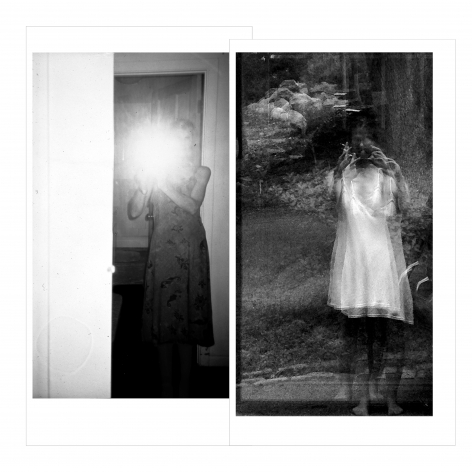 Her images activate light as gesture and assert her presence as an agent of the imagery. At times they verge on the idiosyncratic composition of drawing, and the implied authorship of that deliberate staging, while at others they read as spectral or haunted spontaneities and observations. As though manifesting the invisible latency of lived impressions and their reliance on the individual's subjective apprehension, Wood's images explore the recession and emergence of the past and future in any given moment of the present. The before, after, and eventual are conflated to blur their edges, and the contents of the photograph oscillates within and between these temporal layers. Inevitably, the simultaneous feeling of presence and loss resonates throughout this body of work, as one indelibly defines the other in perpetuity. Wood reveals the subtle and extreme photographic shifts in changing times of day, qualities of light, and physical vantage points, layering images to emulate the amorphous and collectively blurred nature of our experiential impressions. In Parting and Returning, these immersive, and layered composite images are shown alongside single, direct frames to create intersecting narratives and a sense of poetic synchronism. This self-conscious act of looking is central to the construction of Wood's images, as is the pictorial distillation of psychic experience into a two-dimensional format. The complex subtlety of each image commands pause and slows the act of viewing to a poetic or interstitial pace. Whether in her nuanced observations of the shifting qualities of her personal space or the side by side self-portraits of mother and daughter taken some years apart, each image becomes a living imprint and gesture, reminiscent of both time's passing and its cyclical return. Augusta Wood is a Los Angeles-based artist. Her work has been the subject of solo exhibitions at Cherry and Martin (Los Angeles) and Angles Gallery (Los Angeles), and has been featured in exhibitions at The Los Angeles County Museum of Art (LACMA), The George Eastman Museum (Rochester, NY), The Torrance Art Museum (Torrance, CA), Zach Feuer Gallery (New York), and Anton Kern Gallery (New York), among others. Wood’s work has been written about in the Los Angeles Times, Modern Painters, Artillery Magazine, and The Huffington Post. A book of her photographic project entitled I have only what I remember was published in 2014. Her photographs are included in the permanent collections of The Museum of Contemporary Art, Los Angeles (MOCA), and The Los Angeles County Museum of Art (LACMA), and The George Eastman Museum.